We have over 14,000 Scotch, Red, Austrian and White Pine Chsitmas Trees. Our trees are beautiful and healthy. We do soil samples, fertilize and hand-prune every tree every year. We also irrigate whenever we are getting less than an inch of rain per week. Our many repeat customers as well as the pictures on our website attest to the superior quality of our trees. 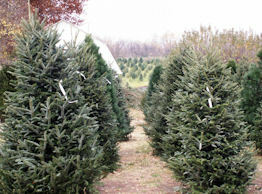 We also provide pre-cut Fraser fir , Canaan fir, Douglas fir, Concolor fir and Blue Spruce Christmas trees. All of our pre-cut trees are premium grade 1 trees. Yes, there us actually a grading system for Christmas trees. Most of the big box stores and retail lots buy what is called "field run trees". That means if they buy 300 trees, they get the first 300 trees from the field - regardless of the quality. At Pumpkins and Pines we only have premium grade 1 trees. The very "best of the best Christmas trees". We also personally visit the tree farm in Michigan where we get our pre-cut trees. It is called Gwinn's Christmas Trees. Mike Gwinn, the owner, cares for his trees just like we do at Pumpkins and Pines so you can be assured that you will always get the very best tree. Additionally, Gwinn's transports their trees to us within seven days of them being cut in the fields. Some of the big box stores reduce their costs by having their trees cut as early as the beginning of October. It reduces their costs but results in a VERY DRY tree. Ask the big box store when their trees were cut. Do they even know? We are confident we have the freshest trees in the Kansas City area. Our field trees range in size from seedlings to over 10 feet (for our home-grown trees) and our pre-cut trees can be ordered up to 12 feet. If you are interested in a tree over 10 feet tall give us a call in early October so that we can guarantee you will have a tree reserved and waiting for you when you pick it up at Christmas. Regardless of your preference we invite you and your family to take a FREE hay ride on our tractor-pulled wagon as you sip our FREE hot chocolate. We will shake your tree for FREE to ensure it is clean, we will also bale it for FREE, and attach it to your car for FREE. You pay for the tree, we do the rest! We also provide bow saws to cut your tree - or if you prefer we can cut it for you. We invite you to stroll through our Christmas store that is warmed by an old-style wood stove and enjoy our many different selections of home made Christmas wreaths as well as a distinctive Christmas decorations and gifts. We also make grave decorations. See more information about our store on our Xmas Shop page. Santa Claus works on weekends in our heated store. Call for his schedule and make sure to bring a camera. Come on out to our farm and enjoy a family Christmas tradition. We look forward to seeing you!